Phew! What a day! I had so much I wanted to get done today that I when I woke up in the middle of the night (as I do about 5 times to pee…the joys of pregnancy! ), I ended up staring at the ceiling for 3 hours! Finally I fell back to sleep for a couple of hours, but I am pretty tired now. So what was I thinking about as I stared at the ceiling…. I was thinking about the 5 properties we are going to see on Saturday and how much I want one of the houses. I was going through my to do list for today, as well as the to dos I need to get done before we leave for Vegas on the 25th. Hopefully that will include making a deal on another house and getting it inspected! Finally, I just got up a started in on the to do list. I looked at the property listings that arrived today, emailed our realtor, worked out, vacuumed, dusted, cleaned the guest bathroom (we have dinner guests tomorrow), submitted my paper and power point for my dietetics course, started and finished my chemistry lab, went to the grocery store, made dinner…. …and now I sit, waiting for Dave to get home. His flight was delayed a couple of hours, so he won’t be home until after 8. I sure hope I’m awake! Luckily our house hunting doesn’t begin until 12:30 tomorrow, so I can catch up on some sleep and my weary traveler can sleep in. In the midst of all the busyness today, I also set up my new toy! 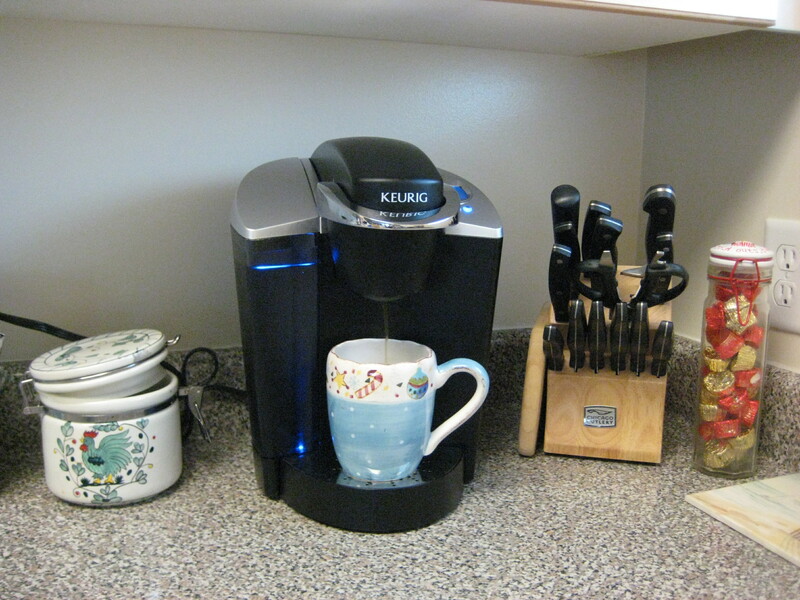 I have been eying my mom’s Keurig machine for months and last weekend, when I was visiting for the holiday, she presented me with her machine! She wanted the newer, updated version, so she bought it and gave me her old one. Unlike the beginning of the week when it was warm and summer-like, today was windy, rainy, and cold. The perfect day for a cup of coffee. My sweet mom even gave me a starter pack of decaf coffees. When I got back from the store I realized I had bypassed hunger and was bordering on ravenous! In 10 minutes, I had dinner made and on the table. 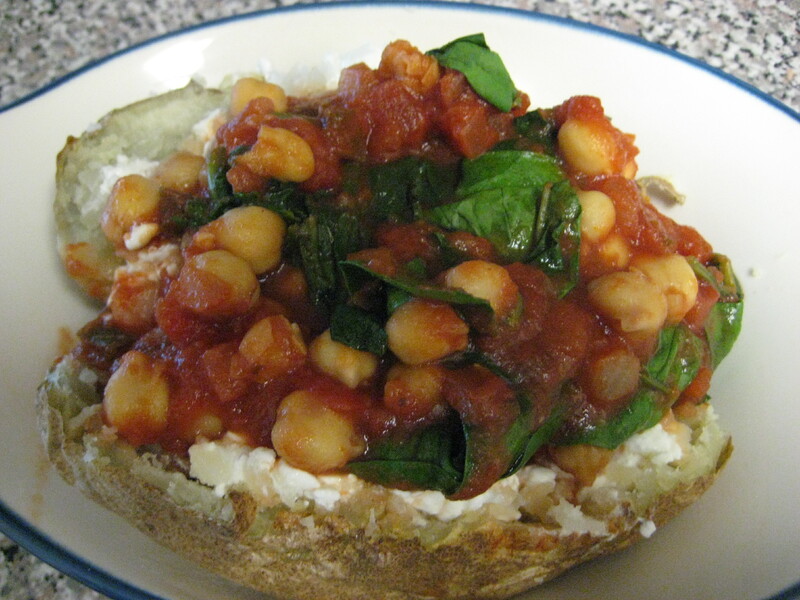 I microwaved a potato, and heated up some salsa, spinach and chickpeas. I topped the potato with cottage cheese and the salsa mixture, and it hit hit the spot in no time at all. This week has included several quickie meals. This quinoa dish with Laughing Cow, tomato, spinach, chickpeas, and artichoke took about 15 minutes from start to finish. And this one was even quicker! 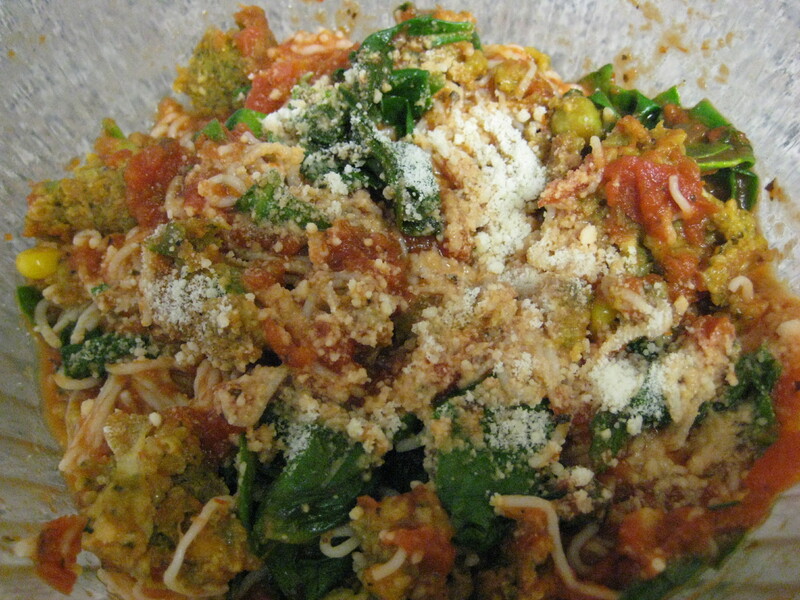 Shirataki noodles with spinach, marinara sauce, and a crumbled Dr. Praeger’s veggie burger. Who needs fast food in a crunch when you can make such healthy meals in minutes! I hope you all have a wonderful weekend. I hope to have good news on the house front when I check in next! Not that kind of running (although I did that too today). I am running out the door for my Wednesday evening class. 5-10pm! Last week he let us go a bit earlier, so I am crossing my fingers we aren’t there until 10 tonight. One good thing about having an evening class is that I have the whole day to study. On the other hand, after studying chemistry for the last 5 hours, the last thing I want to do is spend another 5 in a Microbiology Lab! Oh well. It’s 8 weeks long, and a quarter of the way through after tonight! I am really excited to have this class done in 8 weeks. Then I will only have 2 classes left this semester and a couple more over the summer. Once I am down to only taking a couple of classes, I think I will be able to get a part-time job. I am thinking a gym would be the perfect place to work because you can often work part-time and you get access to the gym. I worked at the front desk at Healthworks when I was in grad school. That was a great gig because its such an awesome gym. I’ll have to see what I can find later in the spring. I’m runnin gto class momentarily, but I’ll leave you with my yummy leftovers for lunch! I drained the broth from the last of my soup that I made a couple nights ago and added some steamed spinach and broccoli slaw, along with some Laughing Cow! It was perfect! One of the perks of studying from home is that I can make a hot lunch pretty easily! 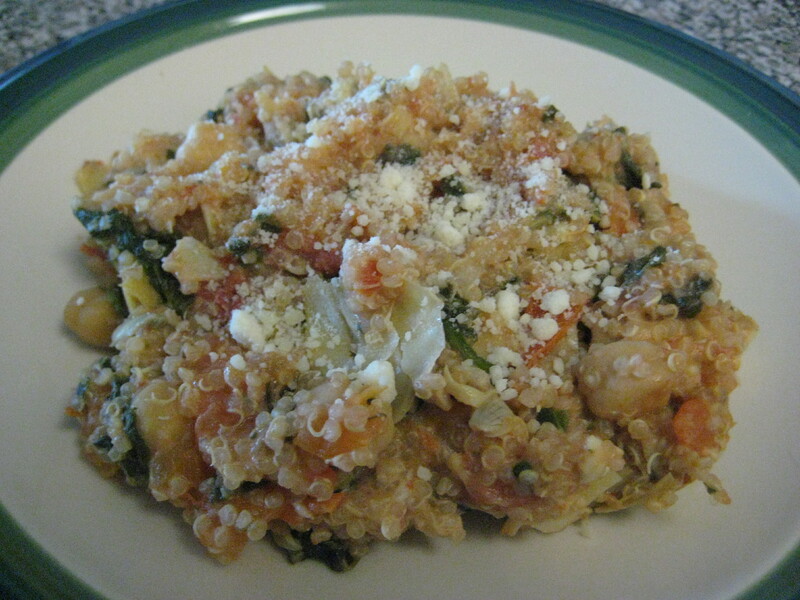 Quinoa is good in just about anything! I paired this (which turned out to pretty much be a hot salad) with a half of an acorn squash. Its really a toss up for me now between butternut and acorn squash. I love them both! I hope you all have a great night. I will be in a dark lab growin gbacteria on petri dishes! Anyone want to trade?! If you were going back to school, what would you study? I would not choose bacteria! But unfortunately, microbio is a prerequisite for dietetics! Ah, what you do for love! Yesterday was another full day of studying. But I am in much better shape with my biology. I stopped about 5:30so that I would have time to be creative in the kitchen and not feel rushed or overly hungry. I enjoy being in the kitchen. But I don’t enjoy it at all when I feel rushed or if I have hit that hunger point where I just want to eat anything to take away the hunger! Today I made sure to leave time to let myself be creative. 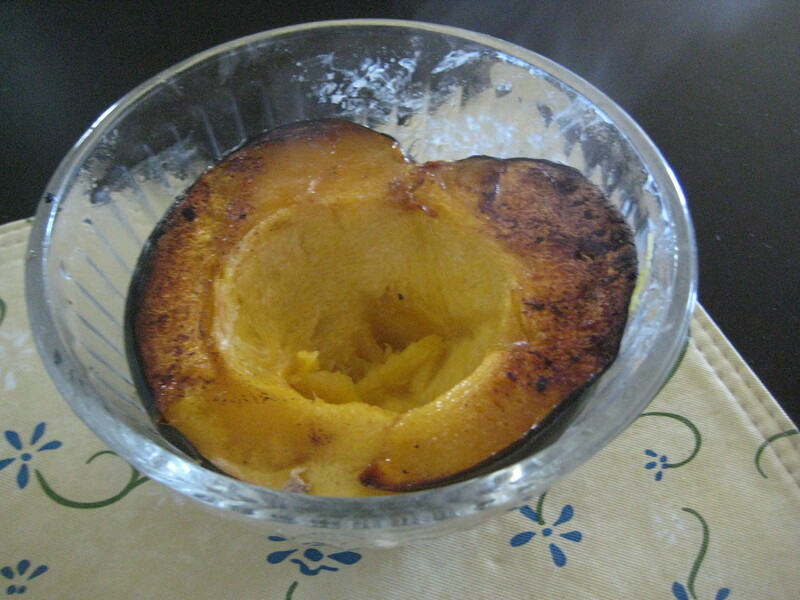 Last week I bought an acorn squash after seeing it all over the blog world. I love winter squash and figured I would love this one as well. Although nothing comes close to butternut, I really enjoyed this one too. I cut open the squash and microwaved it for a few minutes to start it cooking. Then I put it in the oven at 375 and let it roast while I worked on a concoction to stuff inside of it. This sauce is really good and it’s gluten free. Unless you make your own sauce or marinade, it most likely has gluten in it. This one doesn’t. It added a nice sweetness to the quinoa. All together, it was quite pretty! All of those veggies, chick peas, and mango really bulked up my single serving of quinoa! When I tried to stuff my acorn squash, about 2/3 of it overflowed! I didn’t realize how tiny those little acorns are! Dave chickened out at the last minute. Too many “exotic” foods for him. Maybe next time. I ooohed and ahhhed over my dinner enough that maybe he’ll try it next time. I loved all of the flavors! Dave went with his favorite Trader Joe’s prepared meal. Ironically, it is full of veggies! But it loves it…as long as I add a chicken breast so that he gets his meat. I actually love this Trader Joe’s meal, so check it out if you see it. It’s chalk full of gluten-y pasta, so I haven’t been eating it, but it is quite good! Remember how I mentioned the snafu with the college about my course registration. It turned out that they had shut me out from registering because they claimed not to have my high school diploma on file. I was so frustrated! I had to bring a copy to them today. But because of their mistake, I got shut out of the class I wanted. I can still take it, but now I have to take it during the second 8 week session or take it with my current professor who I don’t think is a good teacher. I think I’m going to go with the second 8 week condenses Microbiology. I just really wanted to get it done and out of the way during the first 8 weeks. Grrrr! Dave is off on another trip tomorrow, so I won’t be blogging tonight. Need to get in that time with him before he leaves. But I think my protein pancakes are on the menu for tonight, so check in tomorrow for sure! Today was just what fall in New England should look like! It was beautifully sunny and just brisk enough to want a light sweater. I call it “sweater weather,” and every year I am ready for it. The knowledge that winter looms around the next corner, kind of puts a damper on fall for me. But other than that, I just love this time of year! This afternoon we headed to Honey Pot Hills Orchard in Stow, MA. I had been there before several years ago, but I don’t remember it being quite the operation that it is now! I would be curious to know how many people come through there on a typical day. Today was packed! But it kind of added to the excitement. We have gone apple picking together every year and it is a tradition I really look forward to. We came home with a 23 pound bag of apples (we weighed it on the scale when we got home)! I have one baking in the oven right now and am so excited to eat it. It was a labor of love because I do not own an apple corer and I almost lost a finger or 2 trying to cut out the core. I will not be sharing this beauty! Dave ate 4 apples at the orchard and is not feeling so well right now. I am cutting him off! We made a couple other stops today as well on the way to the farm. I am almost done collecting data for my statistics project on the farming methods of local farms. But I need a few more to make the results statistically significant (look at me throwing around statistics terms!). We stopped off at Verrill Farms in Concord which just reopened it’s main store after it was destroyed last fall in a fire. What a beautiful new building…and brimming with a bounty of fresh fruits, vegetables, breads, and jellies. I collected my data there, and then we stopped at another little farm (it was actually called Small Farm!) we passed on the way tot he orchard. It was so cute, we pulled over and picked up some corn. It was really that small! I came home and studied statistics for a little while (percentiles, z scores, and box plots, oh my!). But I was distracted by my excitement for dinner. I read Nicole’s blog this morning and knew I needed to recreate the quinoa dish she mad. Not only do I love quinoa, but there is so much you can do with it! I had never thought to put ricotta cheese in it. Thanks, Nicole! 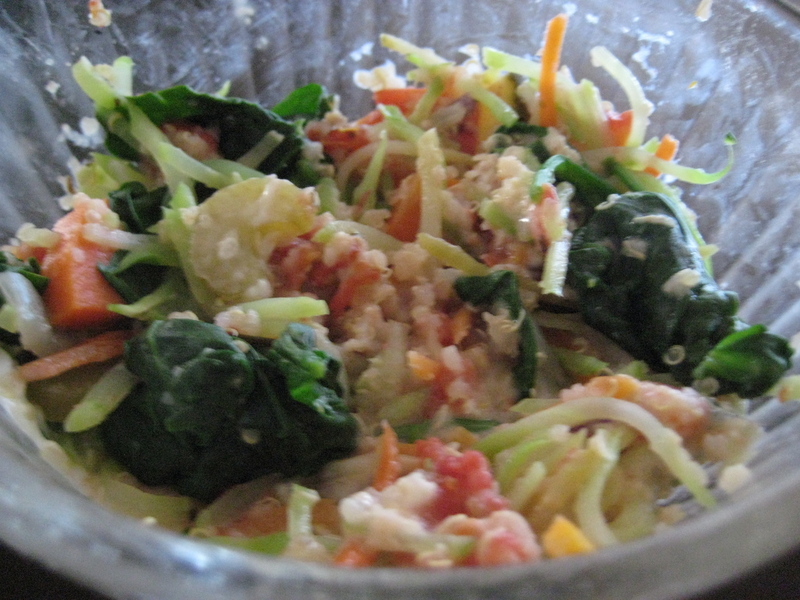 I made mine with an Italian twist…ricotta, artichoke hearts, spinach, diced tomato, garlic and Italian seasoning. I also through in some butternut squash because I needed to use it up. I will probably leave that out next time, as it didn’t really fit with the rest of the ingredients…but it didn’t matter, this was goooood! I topped it with some parmesan cheese. Not the greatest photograph, but trust me, it was delicious! I can smell my baked apple and I can’t wait to eat it, so off I go! My brother is coming up tomorrow afternoon to spend the night and to tutor me in biology. if you don’t see me tomorrow, it’s just because I have my nose in a book or two! I don’t know what got into me today! I left for a run this morning, intending to do an easy 3 miles. I didn’t bring water or gels. I had never run with water or fuel until I started doing 9+ miles, so I didn’t even consider bringing either today. After a mile, I thought to myself “I’m feeling good today, I think I’ll do 6.” At 6 miles, I was still a ways from home. I am new to this area, so I had meandered down a street that took me farther than I thought. But I was feeling good, so I didn’t mind. By the time, I got back to where I would turn into my street, I was at 8 miles. I thought, “I can do 10, then I can say I did a double digit run today.” So I kept going, amazed with myself because I was running a pretty hilly route. I turned around to come home and thought, “A week and a half ago you did 11. You’re feeling good, you can do 11 again.” I hit 11 when I got to the turnoff to my street (again!). I made a split second decision, saying to myself, “If you do 12, you can say you went farther than you ever have, AND you will only be one mile away from completing the half marathon next month!” So I kept going. By 11.5, I realized that I was still feeling good and I could actually make my goal today! So I kept going, running up the long, steep hill I had run twice already, and then back down, arriving home at 13.1 miles!!! I was so excited, I hit the button too quickly on my Garmin. So it reads, 13.08, but I actually did another .15. I won’t win any awards for speed, but I am pleased with maintaining an average 10 minute mile for over 13 miles. You can see how excited I was! I do not in any way recommend going out to run a half marathon with no water or fuel. I am amazed that I did it! I wonder how much faster I might have run today if I had come prepared? If the half marathon I run next month is any less hilly, I should do great….especially because I will absolutely have water and gel. In my Magic Bullet went vanilla whey protein powder, a frozen banana, 1/4 cup oats, and a tablespoon of chia. Soooo good! I hurried off to my biology lab and took my first quiz….the required first biology quiz on the parts of the microscope! Now I have a lab report to write on pH and buffers. Fun! I was really excited for tonight’s dinner. I had precooked some quinoa (about 3/4 cup dry), so it was cooled. I added 2 handfuls of grape tomatoes cut in half, spinach, diced cucumber, 3/4 cup chickpeas, and a diced mango. I tossed it all with 2 tablespoons of Ken’s Steakhouse Herb and Garlic sauce. It makes 2 good-sized servings. The sauce was good. High in sodium, like some many sauces and marinades, but very good, nonetheless. That is a big serving, but this girl just ran a half marathon!! I think it looks beautiful! But Dave took one look and decided it was much too colorful. He opted for a North Dakota Burrito instead. Oh well. He did try it and said it was “okay.” More for me! I now have a ready-made, really good dinner for another night! I’m going to go roll around on my foam roller….still wearing a silly grin on my face!